His name was Joshua Silver. He was 23 years old, educated, and had an impressive vocabulary. The NYPD had found Joshua Silver naked in Times Square, barking like a dog. 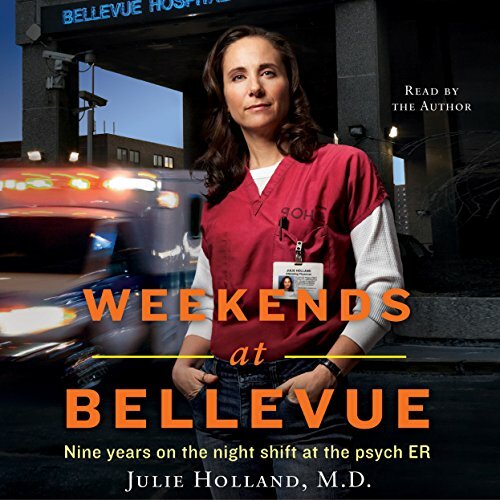 It was just another night for Julie Holland, the attending doctor in the world-famous Bellevue Hospital's psychiatric emergency room. Every weekend for nine years, it was Holland's job to evaluate and treat all patients admitted, from the schizophrenic to the bipolar to the traumatized, from the homicidal to the suicidal to victims of unthinkable crimes. In this absorbing memoir, Holland provides a rare behind-the-scenes glimpse into her life-altering experience at Bellevue, recounting stories of the patients who moved, terrified, fascinated, and amused her, the patients who helped her grow in ways she never imagined. Along the way she documents her life outside the hospital - her relationship with her husband and the births of their children; her own therapy sessions, which helped her finally crack through the tough exterior she had formed; and her close bond with her best friend and mentor, Lucy, a fellow doctor whose battle with cancer left Holland forever changed. As a veteran of crisis mental health centers substance abuse treatment locations and Psyche ER's myself; I found myself nodding and acknowledging Dr. Hollands words about fifty times during the reading. The adrenalized reaction in response to a confrontation. The words and reactions of the patients. A plethora of sad stories from patients on a regular basis. The "shelter" seekers; drug seekers; and the homeless addicts seeking "three hots and a cot" individuals. Equally familiar was the hardness, cynicism, and burnout. The helplessness of their situations and the helplessness you feel about changing any of it. The widening distance between the needs of the patients and the lack of care most states are providing the mentally ill. The author's time at Bellevue ended in 05 and the situation has only become worse in the last eight years. The lack of available treatment; particularly in rural areas now is pathetic. Oops, I'm about to get off on a rant. I was pleasantly surprised at the excellent narration of the author. In many cases this is enough to turn a well written manuscript into an unlistenable disaster. So it was with more than a little trepidation that I used a credit for this selection. As it turned out; Julie Holland was an excellent reader and did a lot to heighten the enjoyment of the audiobook. All-in-all this is one of the best non-fiction selections I've had with Audible. Both somewhat interesting and blatantly self-indulgent, this uneven memoir of Holland's nine years at Bellevue was worth a listen, but I really thought I'd like it more. I was really hoping to hear dozens of interesting stories about the human psyche through a doctor's eyes. There was some of that, but overall I found Holland's discussions of her turf battles with other egomanics, her sexual experimentations, and her crushes on other doctors all a bit disturbing and all a bit of blah, blah, blah. She evidently thinks that banter among doctors -- the sexual innuendo, the cutting remarks, the ego clashes -- is interesting, but it really just sounds like another day at the office for most of us, though I just admit that I was a bit surprised at the level of indescretion, immaturity, and overall childishness of some of her descriptions of her and her fellow psychiatrists' behavior. If you are looking for a book about office politics, I guess this is a pretty good one. If you are looking for a book about the human mind and behavior through the educated eyes of an experienced psychiatrist, then pass on this one. I was hoping for insight into the workings and world of the psych ward, but found a self-indulgent book about a rather uninteresting author. This book was disappointingly boring. Maybe if you've never worked in a hospital? I really wanted to like this book - my best friend is a psychiatrist and I love hearing stories from her job. I'm sorry to say I got really bored because rather than writing about the myriad interesting, funny or politically relevant things that take place in hospitals it seemed to be written about how cool, smart and unconventional the author is. I have been to prisons, spent time with crazy people and not only am I friends with gay people - I am a gay person, so maybe I am awesome and should publish a memoir too? Maybe if you are very sheltered you'd find this more interesting than I did. It also didn't seem to be clear who the audience is because some of the acronyms would only make sense to a healthcare provider but then some things are over-explained. Which makes me think they're in there to sound impressive, like on Grey's Anatomy when they throw around a bunch of big words that don't make sense to make you think they're speaking doctor. This author may well be a fabulous person and there are nuggets of interest but overall the book was pretty annoying. I didn't make it through the whole thing, maybe it picks up at the end. I wanted to give it 2.5 stars but that wasn't an option. She writes pretty well and the narration is ok...at least it's not a distraction. The best way for me to describe the book in one word is boring. It just never gets going. If you want to know what goes on behind the doors of a Pych ER then buy this audio book but be prepared to be underwhelmed. Should be retitled "Me" by Julia Holland M.D. I expected "Weekends at Bellevue" to be rich in stories of the psychiatric patients Dr. Holland has examined over the years. I found, much to my disappointment, the book was more about Dr. Holland's personal life. The narrator, Dr. Holland, drones on in a monotone that made the content even more mundane. I listened to half of the book hoping it would get better. It didn't. Very hard to listen to! This book would be awesome if you worked at Bellevue! But from an EMT with 21 years of experience, this was one hell of a boring book!! Maybe it was the performance, and/or the material, but I didn't make it to the end! I should have listened to the other reviews. This was a terrible book, I just couldn't get into it.